A band I’m interested in is 4m which in the UK we are allowed 70MHz to 70.5MHz. I’m mainly interested in the MS and ‘E’ capability of this band but very few commercial SSB radios have 4m built in so the easiest way is to transvert, usually from 28MHz with a 42MHz oscillator to get 70MHz. For those unfamiliar with transverting this mixing will produce 2 frequencies, one 42MHz above and one 42MHz below, if we take 70.2MHz this means an unwanted one at 112.2MHz and the wanted one at 28.2MHz. All we do is put the IF through a 28MHz filter to remove the unwanted frequency. Although there are few commercial radios there are many commercial 4m transverters available. The one I chose was Bo’s OZ2M which has a single 28MHz IF transceive port and separate 70MHz RX and TX ports. TX output is adjustable on the board for a maximum output of about 150mW and the RX path has about 15dB gain. 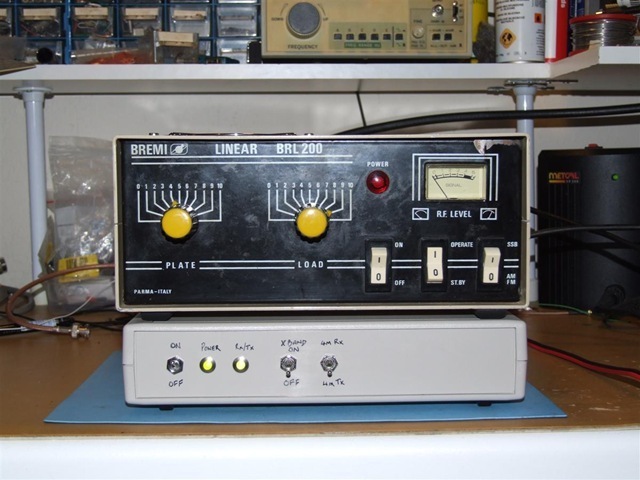 My first 4m system consisted of a boxed OZ2M transverter with a Spectrum Comms TA4S4 4m amplifier providing 45w for the 150mW drive in the TX path. This worked well and it required an RF relay to combine the 70MHz RX and TX lines after the amplifier which meant it made the setup a little more complicated than I would have liked but it worked. I used it on Camb-Hams DX’Peditions to Mull in 2008 and Harris in 2009 with good results, about 33 QSOs in total. 45w was fine but in the UK we are allowed 160w so for VHF NFD 2009 and the Camb-Hams DX’Pedition to Harris in 2010 I decided to make a better PA. This started with buying a Bremi BRL-200 CB amplifier which can be modified to 4m. I had little success at this and could barely get 60w out when the mod quotes over 100w. I had a spare Bremi case, not the one which I used for the 4m amplifier, it was from a CB amp which died years ago, when the transformer failed, and a large heatsink so decided to look into make something a little more powerful and compact. I found a 300w PA covering 70MHz on eBay which used the MRF-151G transistor, this required about 5w drive for 300w out. The MRF-151G is a 48v part so my next task was to get a decent 48v PSU. eBay again helped and a 48v 20amp PSU was bought. I managed to get the 48v PSU in the Bremi box but due to the height of the caps on the PSU board I couldn’t get the amp in. In the end I had to invert the heatsink and have the amp sitting external to the box. This worked but it meant it was exposed and the box was rather empty, not what I had wanted. The other point was generating the 5w drive. The transverters output was 150mW which wasn’t enough and the Spectrum amp was 45w which was too much. Thankfully as the TX line was separate to the RX line I was able to add some attenuators on the TX path between the OZ2M and Spectrum amp so it would only generate 5w. Again this worked but lets look I now had a boxed transverter with the 70MHz transmit leg going to a 30dB attenuator then into the Spectrum amp then into the MRF-151G amp then to a coax relay. All rather messy. I used this for a while but it wasn’t good. If I wanted to do crossband between 4m and 6m there was an additional coax relay. I liked the Bremi box and I knew the system worked with the OZ2M transverter performing well and the MRF-151G producing a stable output – but it was a mess and nearly required a diagram to connect up! I decided to stay with OZ2M transverter but I didn’t want to dismantle my original one as it was quite well constructed so I bought a second one to save the first from destruction :) I also removed the 48v PSU from the box to make space for the amp, transverter and other bits such as the coax relays, logic and other bits. Another thing I needed to overcome was the 5w drive for the MRF-151G amp. I found a design online by GI0GDP using a single 12v device. This was mounted on the heatsink with the MRF-151G amp so that 150mW from the OZ2M transverter would easily produce 300w out the MRF-151G amp. Some of the other changes were bringing the coax relays into the box. I use a YU7EF duoband 6m/4m dual band antenna so I need to bring a 6m feed out to the 6m radio. The antennas comes into the box on a CX-140N coax relay which when the transverter is off (or x-band is enabled) bypasses the transverter to an N-Type on the rear and when energised connects the antenna to another coax relay switching between 4m RX and TX. One new addition was the addition of an 4×20 LCD to show the status of the amp. I monitor the heatsink temperature, the 12v and 48v lines and also which state the system is in, RX or TX. The logic is based on a PICAXE-20X2 which controls which relays are energised and when the fan on the heatsink should be on, based on transmit state and temperature. There is a 4pin DIN on the back which is used for PTT and outputs 12v when the transverter is on, this is for my Icom IC-756pro3 which needs 12v on one of the accessory jack pins to enable transverter mode. Interesting article. I wonder how you manage to throttle back the power out to keep within limits? Nice set up and you always put out a good signal on 4m. I also use a 48v mosfet amp on 4m which I got from the chap in Greece who advertises those “pallet” amplifiers on eBay. Mine is a BLF278. But I found it needed a low-pass filter after the PA though because the third harmonic (210.6MHz) was too high. The fundamental was measured at +47.5dBm, 2nd harmonic -10dBm, 3rd harmonic 23.3dBm (yes plus 23dBm), 4th harmonic -8.5dBm. Hi Chris, might be the same PA we are using as I got mine from the same place. I’m about to start looking at coax filtering as it seems the simple one I’m currently using is not good enough. Sorry for the late reply. So the circuit comes from GI0GDP; http://www.70mhz.org/gi0gdp_PA.htm. It works fine for me, I did have some issue with oscillation but that’s probably my build as I made the PCB a little too small and crammed components in and right next to each other, I also didn’t put this amp stage in a box! It is as you see it in the photo but after a little alignment it is all fine. I have to turn the OZ2M TX level down a bit (VR on the OZ2M) when I use it with the IC-756pro3, infact I think I also increased the resistors in the TX attenuator chain so it would drive it less (<150mW in) so the output would be OK for my final PA. I had the system on a noise figure meter last week and on RX I have about 22dB gain for 1.8dB noise which considering the connectors and relays before the OZ2M transverter I'm happy with that. On TX with the IC-756pro3 driving it I can get 300w out the final PA if required. The active device I just pulled from a PMR radio. I'm not sure if I have anything else but I did get a few PA devices in a bag last weekend which might cover 4m, they were used for a 6m amp so I'll look and let you know.